As some readers may be aware, the Australian Government had previously proposed changes to the process in how we apply for Australian Partner visas. Specifically, with the introduction of the Migration Amendment (Family Violence and Other Measures) Act 2018, it was suggested that before a Partner visa could be applied in future, the Australian sponsor would need to first be approved as a 'family sponsor'. Importantly, this was a key change to how Partner visas had been prepared and submitted for many many years where there was no such requirement, and both the sponsorship and visa could be submitted together. This often allowed us to submit applications in urgent situations, where for example, the visa applicant was currently inside Australia and their visa was expiring. By being able to submit applications quickly, we were able to secure a bridging visa for applicants allowing them to remain in the country lawfully until a decision had been made on the Partner visa. As things stood, the proposed changes were not yet 'in effect' and it was business as usual. As of today, the 9th April 2019, we have received confirmation that provisions and requirements set out in the Migration Amendment (Family Violence and Other Measures) Act 2018 will come into effect on the 17th April 2019 bringing in a new age in the way Partner visas are prepared and submitted. To confirm, from the 17th April 2019 onwards, it will be a requirement that the sponsorship in relation to an Australian Partner visa be submitted separately and before the application of the Partner visa. Only once the Australian has been approved as a 'family sponsor' will their spouse/partner be eligible to apply for the Partner visa, and for those onshore at the time of lodgement, be eligible for the grant of a Bridging Visa. 2. As above, couples looking to apply for off-shore Partner visas (such as the 309/100 and PMV 300) should not, necessarily, be looking to rush into lodging an application unless they are confident they already meet the visa criteria. 3. We do not yet know the specific criteria for the approval of a 'family sponsor' in relation to Partner visas post 17th April 2019, however we assume the criteria will be similar, if not identical, to how sponsors are currently assessed, except the difference being this is now done 'upfront' as opposed to when the partner visa is assessed as per the OLD Process pictured above (stay tuned). Importantly, this may require that sponsors provide police clearances from both Australia and countries lived in overseas with their sponsorship applications. As these clearances can take several weeks to be returned it may be advisable to start arranging these asap. 5. This does NOT IMPACT applications already submitted and pending with the DHA. Our office will soon be getting in touch with all our pending Partner visa clients to advise and plan regarding the 17th April 2019 implementation date of these changes. Rest assured we are 'onto it'! For those reading this who are not yet Salvo Migration clients and would like to discuss their Partner visa case, you can chat with our legal team, for free, on Facebook Messenger by clicking on the 'Lets Chat' button below. Otherwise, for those interested in commencing their matter with priority please leave an enquiry online here. Welcome readers to another edition of our monthly newsletter! We know you are busy and have a lot of things on your mind, so we will get straight into it! We have now added a Testimonials section on our website which you can view  here. Each month we will add any newly received testimonials that visitors are welcome to scroll through. To see the full Pricing Page please click ​ here. To watch the Webclass please click  here. Parent Visas: Whats The Best Option? ​Australia's first and only DIY Visa Preparation Platform 'Veazy' is currently being Beta Testers by over 15+ couples preparing their Australian Partner visas and the feedback so far has been nothing but overwhelmingly positive​. See below for a couple of examples! For those interested, we will be launching Veazy to the general public soon. Stay up to date and be the first in line to use Veazy by subscribing  here. To speak to our legal team and leave a visa enquiry, please contact us  here. ​Click  here to download the diagram. Option 1: Apply for an off-shore Partner (Subclass 309/100) visa, also referred to as a De Facto or Marriage Visa from outside the country. Option 2: Apply for an off-shore Prospective Marriage (Subclass 300) visa, also referred to as a Fiancé visa. Option 3: Apply for an on-shore Partner (Subclass 820/801) visa also referred to as a De Facto or Marriage Visa from inside the country. Importantly, the purpose of this blog is not to detail each option, but rather, this blog will discuss what we like to call the Partner Visa Journey and will typically cover both Options 2 and 3 above. Specifically, the graphic above details the common ‘Stops’ along the way for Partner Visas, from when an Australian meets their partner to when the partner is granted permanent residency. As the graphic suggests, depending on whether a couple first applies for a Prospective Marriage (Subclass 300) visa or goes directly for the Partner (Subclass 820/801) will determine which ‘Stop’ the Journey begins for that respective relationship. For those who are not yet in a position to apply for the Partner (820/801) visa directly, such as those who are not currently in Australia or are not yet married or in a de facto relationship, the Prospective Marriage visa is vehicle for engaged couples to bide their time in arranging their marriage with the view that they will formalize their marriage once the Prospective Marriage Visa is granted (Stops 2 – 4). After the marriage, couples will be able to apply for the Partner visa (Stop 5) from inside Australia and continue on along the Partner Visa Journey until eventually their permanent residency is granted (Stop 8). For couples who are inside Australia and are married or in de facto relationships, their journey begins at Stop 5 when the Partner visa is applied for from inside the country, again eventually leading to permanent residency at Stop 8 if the relationship is maintained. 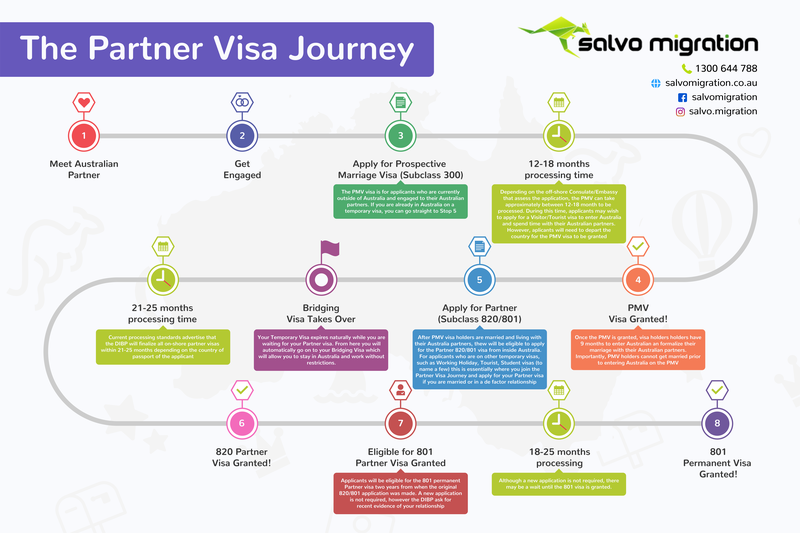 In conclusion, there is an overwhelming amount of information on Partner Visas, so we hope that our Partner Visa Journey graphic will help you understand the pathways, processing times and generally how one visa flows onto the next. ​Looking for a little more information on Partner visas? Get our completely FREE 21-page Workbook titled 'How to Get Your Australian Partner Visa Approved (And Avoid The Top 3 Reasons for Refusal)' for FREE (Ordinarily sells for $6.95 AUD). ​​ We Respect Your Privacy. No Spam Ever. For example, see below an example of a wonderful testimonial left for Salvo Migration this month as well as flowers sent by a happy client! Here's some other statistics you may find interesting about February 2019. Here at Salvo Migration we love photos almost as much as we love helping people secure their visas to Australia! Want to see more? Click ​ here to follow us on Instagram! Need an immigration lawyer you can trust? Contact us today! Click  here to leave an online enquiry. 5 Top Tips to Instantly Improve Your Partner Visa! Lodging a partner visa? Buried in paperwork? Applying for a partner visa can be demanding, time consuming and an emotional roller coaster – therefore, we thought we would try and help steer you in the right direction. So here are our 5 top tips to instantly improve your application and maximize your chance of success (Secret...these are the same things we do for our own successful Partner visa applications (examples here). For couples who are not yet married and are applying for a Subclass 820 or 309 under the grounds of being in a 'de facto relationship', it is important to understand the difference between when you started ‘dating’ and when your relationship developed into a ‘committed, de facto or married’ relationship. This ties into the visa requirements of the Partner visa in that at the time of application you must be able to show you are 'more than just boyfriend/girlfriend, boyfriend/boyfriend or girlfriend/girlfriend). Accordingly, the Australian Government (aka the Department of Home Affairs - DHA) differentiate a relationship from ‘dating’ to ‘de facto’ when you can clearly demonstrate relationship factors such as your cohabitation, pooling of finances and the recognition of your relationship socially as a committed couple. Clearly outlining your timeline to the DHA visually helps to very quickly and simply explain to your case officer the important and key milestones they are looking for when assessing you against the 'time of application' Partner visa criteria. Please note, the above should be used as an example as there is no limit in terms of how many dates/events you can include in your timeline. That being said, the more you do the better prepared your application will be! For example, other dates/events you can include are a) date engaged, b) date Civil Union registered, c) date married (if applicable), d) date child born (if applicable), e) date joint property purchased, f) date large overseas holiday etc. IF YOU WOULD LIKE A COPY OF THE ABOVE 'RELATIONSHIP TIMELINE TEMPLATE' YOU CAN DOWNLOAD ONE FOR FREE HERE (NO EMAIL NECESSARY). 2. Make Sure Your Information & Documents are CONSISTENT! ​Minor mistakes including inadvertent inconsistencies can prove costly down the line and result in delays in obtaining your visa. The dates and information across all documents must be consistent, or any legitimate inconsistencies must be clearly explained up front. This includes cross checking key dates provided in the application form with the supporting evidence - relationship statements, joint leases, bank accounts, travel itineraries etc. Any social media accounts or statements provided by family/friends must also be consistent with your application and documents. Immigration can cross check with any information publicly available or verify information directly with your witnesses. Therefore, if your social media profiles are set to PUBLIC, it is advisable that you change your 'relationship status' to reflect the dates claimed in your application (and hopefully in your Relationship Timeline should you use our template mentioned above). 1. Are the dates I have included in the Application form consistent in the Sponsorship form? 2. Are the dates we have declared in our Relationship Statements consistent with both the Application and Sponsorship Form? 3. Is our Relationship Timeline Diagram consistent with the Relationship Statements, Application and Sponsorship Forms? 4. Do our supporting documents verify the dates we have claimed? A key factor is ensuring your documents are organised and re-named in accordance to the document upload framework in IMMI systems. Highlight your names and addresses on all documents, particularly where it demonstrates joint ownership or cohabitation. Merge any documents that belong together e.g. photos, social media extracts and phone records. Immigration are ultimately looking for whether a relationship is genuine. The documents alone will not always paint a clear picture of the nature of your relationship or your love for each other. It is therefore important to write detailed and compelling statements that explain how you met, your timeline, any key milestones and your future plans. Including key words of ‘love’, ‘commitment’ and ‘children’ can make the statement a more personal insight into your relationship and show your long term plans to be together, forever! Additionally, there is no 'word limit' and you are welcome to be as descriptive as you wish, however we always make sure our clients are writing factual and emotionally compelling statements. For example, a smaller statement that uses 'love language' and clearly explains the care and commitment a couple have to each other will always hold more weight than pages and pages of cold and calculated phrasing. Don't be afraid to get emotive...this is your chance to essentially write your own love story (sorry, no vampires 率). One of the most common requests we receive from clients is to prepare their application ‘quickly’. We of course always aim to work efficiently, however our advice is always that it is better to prepare an application thoroughly and to ensure our clients satisfy 'time of application criteria', rather than risk rushing through an application unnecessarily. Accordingly, unless you are pressed by an upcomming visa expiration date or deadline, and you have time up your sleeve, an intentional strategy you may choose to implement is to wait as long as possible before applying. The aim being, that you will have more time to compile and strengthen your facts and evidence before lodgement. This might mean something as simple as holding a joint account for a longer period and using it more frequently. The focus here is again to ensure you meet 'time of application' requirements with your evidence showing you are in a committed de facto or married relationship when your application is submitted. All too often couples apply sooner than they should simply because they assume they meet the visa requirements. So if you have time, use it and remember that some of the more substantial relationship evidence is often provided by third parties including statements from family or friends, financial documents, wills & last testaments etc. Looking for a little more information on Partner visas? Get our 21-page Workbook titled 'How to Get Your Australian Partner Visa Approved (And Avoid The Top 3 Reasons for Refusal)' for FREE (Ordinarily sells for $6.95 AUD). ​ ​ We Respect Your Privacy. No Spam Ever. To quote the great Bob Dylan...The times they are a changin'. Indeed this is becoming more prevalent in the way emerging cryptocurrency and blockchain technology is shaping to change our lives and futures in a variety of industries. We cant profess to be IT experts here at Salvo Migration (unfortunately we are only experts in Australian immigration law), however, we are always looking at ways to make our clients lives as stress free as possible. With this end in mind, we are pleased to announce that our clients will now be able to pay for their professional fees and Home Affairs Visa Application Charges using a variety of cryptocurrencies. We hope this will give clients more flexible payment methods and make things a little more manageable when budgeting for all the costs associated with any visa application. Today, migrants across Australia are rejoicing as yesterday evening the Australian Governments proposed Bill to enforce strict changes to Citizenship requirements was killed off in the Senate. The effect of this is that Citizenship applications submitted after 20th of April 2017 will now be assessed under the current rules, ending a 6 month stand off in which applications had been put on hold by the Department of Immigration and Border Protection. What is yet to be seen is the processing/waiting times that applicants will now have to endure as the DIBP undoubtedly works through an unprecedented backlog of applications, however as a whole, we view today as a good day for migrants in this country! To help readers better understand the Residence Requirement to be eligible for Citizenship, we have put together a 7 page eBook PDF with visual examples of when migrants are or are not eligible for Citizenship depending on the amount of time spent inside or outside of the country. To get a copy of our PDF, click on the 'Send to Messenger' button below to be sent a copy directly to your Facebook Messenger. Anyone that requires assistance with the preparation of their Citizenship application is welcome to contact our office in the form below. We will respond within 24 hours​ of any enquiry. For your reference, our Professional Charges to prepare Citizenship applications is currently fixed at $1500 (plus GST) per applicant. Please note, this does not include the application charge currently set at $285 per applicant. More Australian Visa Changes - 1 July 2017! If you would like to know more about the changes specific to each visa type mentioned above, click on the 'SEND TO MESSENGER' button below to be sent easy to follow information straight to your Facebook Messenger (Opt-Out at Any Time). ​Also, do you have Australian immigration/visa questions? Feel free to join our free private Facebook group Salvo Migration Community. In this group our team will provide visa information, let members know of important visa updates as well as answer members visa related questions (as quickly as we can!). It’s also a great place for people to share visa stories, tips and help each other. If you would like to join, please click here – its FREE! Otherwise, if you require the representation of a Migration Agent in Brisbane City today, then feel free to contact us on 1300 644 788 or send your questions here. How to be Sponsored as a Chef, and NOT as a Cook! From 19 April 2017 – the occupation of Cook (ANZSCO 351411) was placed on the 'BAD LIST' of occupation lists, meaning that new Subclass 457 visa applicants in this occupation would not have a clear transition pathway to permanent residency. To be specific, the occupation of Cook now only appears on the Short-term Skilled Occupation List (‘STSOL’) and NOT on the Medium and Long-term Strategic Skills List (‘MLTSSL’). The big difference is that occupations, such as Cook, listed in STSOL are only permitted to work temporarily in Australia and without a pathway to Permanent Residency. Importantly however, the occupation of Chef (ANZSCO 351311) is still available on the MLTSSL, which does offer a Permanent Residency Pathway through both the existing Subclass 457 Temporary Transition Streams to Permanent Employer Sponsored visas, and through the upcoming new Temporary Skills Shortage (‘TSS’) visa. Accordingly then, given the very close relation between the occupation of Cook and Chef, we thought it would be useful to write a blog which explained the differences from both the employers requirements and the employees (visa applicants) requirements. So what does this mean for Cooks? Cooks who are currently on existing Subclass 457 visas will be encouraged to apply for the Permanent Residency as soon as they are eligible. Please keep in mind what has been mentioned in our previous blog with regards to the recent visa changes and how current 457 visa holders applying for PR in future may be affected. Become skilled and qualified as a Chef and look to sponsored for either the 457, ENS or RSMS visa under that occupation (discussed below). IMPORTANT QUESTION #1 – What type of Employer can Sponsor a Chef? Employers will be able to sponsor a qualified chef, provided the workplace and nature of work to be completed in the nominated position has certain characteristics. To be employed as a chef, the work required to be completed must be above the normal duties and responsibilities that are required of a cook. The basic distinction is that the role of chef will only be required within an organisational structure if there is at least a cook who will be supervised by that chef. If an organisation has only a single person performing the “cooking" function, the relevant occupation is likely to be that of a cook. This is because in these circumstances, it is likely that the person will spend most of their time on cooking, rather than managerial tasks. If the Employer believes that a stand-alone cooking role is that of a chef, the onus is on them to provide justification. explaining and enforcing hygiene regulations. Fundamentally, the primary role of a cook is one of cooking, whereas that of a chef is managing the kitchen with some limited, specialised cooking tasks. Chefs and cooks are also differentiated on skill level under the ANZSCO framework. The occupation of chef is at skill level 2 (requiring a diploma or higher qualification) whereas the occupation of cook requires only an AQF Certificate IV or an AQF Certificate III including 2 years of on-the-job training. Furthermore, depending on the relevant assessing authority (for the Skills Assessment), they may allow a lower qualification for both occupations provided you have sufficient work experience as well. See below for more information on ‘How do I become qualified as a Chef?’. The environment in which the tasks are performed may be an indicator as to whether the occupation is actually that of a chef, cook or fast-food cook. The occupation of chef will generally relate to a restaurant environment. It is unlikely that the tasks relating to this occupation will need to be performed in an environment such as a take away establishment or an establishment operating in a food court. Establishments providing catering services may employ chefs, depending on the nature and size of their operations. The occupation of cook may be relevant in the case of smaller restaurants. The Department of Immigration case officers will need to assess on a case by case basis whether the tasks performed in the particular environment would require the skills of a cook. that covers a diversity of styles of cuisine. Casual dining outlets are food outlets that are located in shopping strips and within food courts in shopping centres. Table service is not generally provided, though some outlets may have limited seating or shared seating with other outlets (in food courts). Some such outlets offer food items from a pre-cooked display at their counters. The food served may be cooked on the premises or brought in from a different location where the food is cooked. The range of food offered is a factor that needs to be considered, in assessing whether the preparation would involve the services of a cook. In assessing whether the business would require a cook in such an environment, DIBP case officers would ascertain who cooks the food offered and where it is cooked. If the food sold at the outlet is purchased from a supplier, the business would not be able to substantiate the need for a cook. Some casual dining outlets may have a menu offering food items that are cooked on the premises. The range of food offered on the menu and the relative complexity of preparation of the food should be considered in assessing whether the services of a cook would be warranted. Fast-food outlets typically offer items that are simple and quick to prepare. do not offer table service. The food preparation work carried out in a fast-food outlet would generally require the skills of a fast-food cook, rather than a cook. These occupational caveats confirm the DIBP policy position on some of the tasks and duties performed in Casual Dining Outlets (as mentioned above). Whilst Casual Dining Outlets have not been explicitly excluded in the ceveat, it has certainty restricted to what is defined as an acceptable work environment for Chefs. IMPORTANT QUESTION #2 – What do I need to be sponsored as a Chef? Assuming your employers restaurant fits within the description above and that the workplace is eligible to sponsor Chefs, the next question is what do you need as an applicant to apply under the occupation of Cook. The answer to this question depends primarily on what visa you are trying to be applied for. You will need to meet the general visa application requirements, click here to understand the basic requirements. The occupation of chefs under the ANZSCO framework require a diploma or higher qualification. However, ANZSCO also accept at least 3 years’ relevant experience will substitute for the formal qualifications. Even just a Diploma of Hospitality has been stated as being sufficient by itself with no Cert III or IV when looking at the requirements of Chef under ANZSCO (see here - visa being applied for was an RSMS, however same assessment of ANZSCO requirements apply to a 457 visa). If you are NOT from one of those listed countries, the case officer will still require evidence of relevant work experience and qualifications outlined by ANZSCO (and in some circumstance other relevant skills assessment at their discretion). You will need to meet the general Subclass 186 visa requirements, click here to understand the basic requirements. If applying under the TRT stream then NO Skills Assessment needed. If applying under the DE stream, you will require skills assessment + at least 3 years skilled employment + Competent English (unless an exemption applies). Counties listed below will apply for Skills Assessment through VETASSESS. Brazil, China, Fiji, Hong Kong SAR, India, Iran, Ireland, Macau SAR, Papua New Guinea, Philippines, Republic of Korea, South Africa, Sri Lanka, Thailand, United Arab Emirates, United Kingdom, Vietnam and Zimbabwe. For Chefs - VETASSESS requires Certificate IV in Commercial or Asian Cookery and have at least 5 years’ experience in your occupation at the skill level required. This may include time spent in training. Your evidence must show you have worked in your occupation in the last 3 years and must be able to be verified. After assessing your work experience and relevant qualifications, VETASSESS will be able to determine if you are suitable for a migration skills assessment as a Chef. To obtain further information please see the VETASSESS fact sheets here. For applicants NOT listed in the above countries please see guidelines here for the MSA Skills Assessment. For occupation of Chef – TRA requires Certificate IV in Asian Cookery or Commercial Cookery (see here) AND 3 years full-time employment AFTER qualification issue date for domestic/internationally awarded qualifications OR 6 years full-time for Australian issued RPL (where employment can be before or after qualification). The Skilled Date according to the TRA MSA Guidelines (and therefore relevant/counted experience), is from the date you gained a Recognised International or Australian Qualification. Further TRA does NOT accept work experience as a substitution for a qualification. If you do NOT have relevant qualifications, you will need to undertake ‘Recognition of Prior Learning’ (RPL) courses with a Registered Training Organisation (RTO) prior to applying to TRA. You will need to meet the general Subclass 187 visa requirements, click here to understand the basic requirements. Further TRA does NOT accept work experience as a substitution for a qualification. If you do NOT have relevant qualifications, you will need to undertake ‘Recognition of Prior Learning’ (RPL) courses with a Registered Training Organisation (RTO). This in essence sums up the main points you need to understand when considering if you and your employer are eligible to sponsor as a Chef. ​Have Australian immigration/visa questions? Feel free to join our free private Facebook group Salvo Migration Community. In this group our team will provide visa information, let members know of important visa updates as well as answer members visa related questions (as quickly as we can!). It’s also a great place for people to share visa stories, tips and help each other. If you would like to join, please click here – its FREE! Otherwise, if you require the representation of a Migration Lawyer in Brisbane today, then get in contact on 1300 644 788 or send your questions here. Australian Citizenship Changes – Effective Immediately from 20 April 2017! On the 20 April 2017 the Australian Government made a significant announcement in relation to Strengthening the Integrity of Australian Citizenship. A new process for determining an applicant’s integration into the community. These new changes will only affect Australian Citizenship applications made on or after 20 April 2017. DIBP assures that applications made before 20 April 2017 will still be assessed according to the old rules and regulations made before 20 April 2017 (and will not be affected by the new reforms). Prior to the changes, applicants applying for Australian Citizenship needed to demonstrate they had resided in Australia for four (4) years (on any visa) including one (1) year as a permanent resident. However, under these new changes, all applicants will need to hold Permanent Residency status for four (4) years to be eligible to apply for Australian Citizenship. Essentially, this means that non-citizens who are currently waiting to apply for Australian Citizenship will NOT be able to use their time as Temporary Residents as part of their four (4) year requirement. These new changes will only accept four (4) years of Permanent Residence. The new reforms will also require that applicants pass a stand-alone English test, involving reading, writing, listening and speaking. All applicants will need to demonstrate competent English. For example, applicants must achieve at least a 6 in each of four test components in an IELTS test (International English Language Testing System). Importantly however, there are some exemptions available in relation to this English requirement, such as those who have a permanent or enduring incapacity and for those under 16 years of age or over 60 years of age. Currently, there is NO limit to the number of times an applicant can fail the test. The new changes implemented on 20 April 2017, will enforce a maximum limit on the number of times an applicant can fail the Australian Citizenship test to three (3). Furthermore, there will be new rules to automatically fail applicants who cheat during the Australian Citizenship test. The test questions will also contain new and more meaningful questions that assess an applicant’s understanding of, and commitment to, the Australian shared values and responsibilities. As part of the new reforms, all applicants will need to demonstrate the steps they have taken to integrate into and contribute to the Australian community. For example, applicants will need to include evidence of employment, membership of community organisations and school enrolment for eligible children. In addition to the integration requirement, any conduct that is inconsistent with Australian community values will be also be considered as part of this process. For example, evidence of criminal activity, involvement in gangs or organised crime, violence against women and children, will be deemed as thoroughly inconsistent with Australian values. With the recent changes, Salvo Migration has received many questions from the public concerning the new rules surrounding Australian Citizenship. For this reason, we have complied a short FAQ based on the information currently released by the Australian Government. 1. I have already applied for Citizenship prior to 20 April 2017 – am I still affected? No – you will not be affected by the new changes. DIBP has assured that these new reforms will affect Australian Citizenship applications made after 20 April 2017. However, keep in mind, that DIBP may contact you for further information and you must comply with all requests made by DIBP. 2. I have been a permanent resident for 12 months already, do the new rules apply to me? Yes – unfortunately all the new rules, including the 4 years as a permanent resident requirement and increased IELTS of 6 in each band (i.e. competent English). 3. I have previously failed the test 3 times; will I be able to apply again? At this stage, the full details of these new rules have NOT been released, however, assuming that all these changes are being enforced from 20 April 2017, we can only speculate that you will be able to undertake the ‘new’ test and will be assessed under the ‘new’ Australian Citizenship rules. Your previous failed test results will relate to the old test. Make sure to check back here again – as we will update this blog when we receive further information. If you require the representation of a Immigration Lawyer in the Brisbane CBD today, then feel free to contact us on 1300 644 788 or send your enquiry here. 457 Visas Abolished - Are You Affected? Everything You Need to Know! On 18 April 2017, the Australian Government announced that the subclass 457 will be abolished, and be replaced by the new Temporary Skill Shortage (TSS) visa, which will begin in March 2018. Furthermore, changes have also been made to all Skilled Migrant and Employer Sponsored visas eligible list of occupations. Given the significance of these recent announcements, we hope that this blog will help simplify what we know so far and help answer any questions you may have. For your reference, you will also find a FAQ at the end which you may find helpful. By March 2018 the Australian Government will cease accepting applications for Subclass 457 visas. However, not all hope is lost – the Subclass 457 visas will be ‘replaced’ by a new TSS designed to better address genuine skill shortages in the work force and to safeguard and prioritize Australian workers. ​For non-regional Australia, the occupation must be on the STSOL (Schedule 2). English language requirements: A requirement of an International English Language Testing System (IELTS) (or equivalent test) score of 5, with a minimum of 4.5 in each test component. Option 2 - Medium-Term visa stream (up to 4-years in duration). Renewal: Capacity for visa renewal onshore and a permanent residence pathway after three years. For non-regional Australia - the occupation must be on the MLTSSL (Schedule 1). English language requirements: a requirement of a minimum of IELTS 5 (or equivalent test) in each test component. As further information on these visas becomes available we will continue to udpate this section. The Australian government has also significantly condensed (reduced) the occupation lists used for Skilled Migration and Employer Sponsored Migration. Essentially, the Consolidated Sponsored Occupation List (CSOL) (currently used for most sponsored visas such as ENS and 457) is being replaced by the Short Term Skilled Occupation List (STSOL). There has been a removal of 216 occupations from CSOL in creating the STSOL. Some applicants in the Training visa (subclass 407). The Skilled Occupation List (SOL) is being replaced by the Medium and Long Term Strategic Skills List (MLTSSL). Click here to see the new MLTSSL (i.e the old SOL). Of the occupations which are still ‘sponsorable’ under the 457 visa, 59 occupations now have additional criteria. These additional criteria vary depending on each of the 59 occupations and are best listed here (PDF download). Readers are advised to find their occupation on SCHEDULE 2 (Page 14 onwards) of the PDF download and identify if there is a ‘Note’ beside their respective occupation. If so, you can scroll down to the bottom and read that note, otherwise referred to as additional criteria applicable to 457 Nominations submitted under that occupation. Note 24 then goes onto to clarify that the occupation of Cook cannot be sponsored on the ENS in Fast Food or a Takeaway Food Service. Update! The full list of ceveats has now been summarized by the DIBP here. Importantly, these changes affect even applicants who had applied before the changes and are still currently awaiting a decision. Despite the announcement only recently having been made, Salvo Migration has received many questions from the public concerning 457 visas and permanent visa options in future. For that reason, we have compiled a short FAQ based on the information which is currently available to our office. 1. I am already on a Subclass 457 visa, will my current visa be affected? For current subclass 457 holders, there are currently no announced changes. According to the announcement made on 18 April 2017 (found here), the Hon. Peter Dutton, Minister for Immigration & Border Protection, mentioned that current 457 holders can continue on with their current visa until its natural expiry date. This suggests that current 457 visa holders are not at jeopardy to have their visas cancelled due to these announcements but merely lead to the closure of all new 457 applications by March 2018. 2. I have submitted a 457 Nomination & Visa which are both still pending with the DIBP, however that occupation has now been removed from the new list, will my pending application be affected? Salvo Migration has received policy guidance on the DIBPs approach to lodged and unfinalized 457 Nomination applications for occupations that have been removed. The DIBPs policy is that these applications will not be approved and that a refund can be sought by applicants. We unfortunately suspect that this is likely to impact many applicants who may find themselves in the precarious position of having to withdraw their Subclass 457 visa applications (to avoid a refusal and a potential Section 48 bar) and be on a Bridging Visa with a pending expiry date. We suspect these applicants will find it difficult to potentially apply for another visa, such as a Student visa, due to legal requirements preventing such visas often being applied for by holders of bridging visas. 3. I have submitted a 457 Visa and my employers Nomination has already been approved, will my pending visa application be affected? Under these circumstances if your occupation is not on the new MLTSSL then your visa will only be granted for 2 years. Furthermore, there will be one (only) further extension allowed after that for another 2 years. You will not be allowed to apply for a permanent 186/187 visa under that occupation. This is likely to affect applicants applying for such occupations as Cook, Restaurant Manager and other common occupations previously used regularly on 457 visas which are not on the MLTSSL. Alternatively, if your occupation is on the MLTSSL list, it can be granted for 4 years. You will be able to be apply for a permanent 186/187 visa after 3 years on a 457 visa if that company decides to nominate you. 4. I have submitted a 457 Visa and my employers Nomination is also still pending with the DIBP, will my pending visa application be affected? 5. I am on a Subclass 457 visa and have almost completed two years employment with my sponsor. Will I still be eligible after the two year mark? Applying for residency after two years on a 457 is commonly defined as the process of applying for a Subclass 186 (ENS) visa (i.e a permanent visa). There are currently two streams that allow applicants to qualify for the ENS 186 visa. The stream 457 visa holders generally wait two years to apply for is the Temporary Transition Stream. Accordingly, the changes to the occupation lists do not affect applicants applying for the ENS under the Temporary Transition Stream who had their 457 visas granted prior to 18 April 2017. The changes to the list affect only Direct Stream applicants or applicants who have their 457 visas approved after 18 April 2017. In saying this, as of March 2018 it unclear if the rules of the ENS visa will also change extending the two (2) year requirement to three (3) years. Accordingly, this may mean that current 457 visa holders who have not accumulated a full two years with their current sponsors on their Subclass 457 visas by March 2018 may no longer qualify for permanent residency (as it may have been increased to three years). If this is the case, we foresee complications for 457 visa holders who would not have met the 2 year requirement before March 2018 and also do not have a valid 457 for long enough to accumulate the newly required three (3) years. Such visa holders may find themselves in a position of not being able to apply for the ENS or even renew their 457 visa as the visas would have by then been abolished. 6. I am on a Student/Working Holiday visa, how do these changes affect me? As things stand currently, if your occupation has remained on the list then you are still able to apply for a Subclass 457 visa under the current arrangements. Keep in mind however that all new 457 visas will now be granted for a maximum of 2 or 4 years depending which new list your occupation falls into (as mentioned above). Furthermore, as also explained above, if your occupation is not on the MLTSSL then you may be unable to transition to permanent residency from your 457 visa. Future international students and working holiday visas however will undoubtedly find it more difficult to apply for the new TSS visas as of March 2018 given specifically what seems to be the requirement that applicants have 2 years full time work experience in their occupation. Appreciating that international students often have no post-qualification work experience in their occupation (as they have just completed their studies in Australia) we see this as directly impacting the international Student community. For those that are eligible, we foresee that Students will need to apply for a Graduate 485 visa after their studies, with the hopes of securing full time work whilst on that visa before potentially applying for the new TSS in future. FREE Webinar: 457 Changes - Impacts on Your Eligibility for Permanent Residency! Since the changes explained in this blog were announced, we have received hundreds of enquiries from confused and concerned visa holders. Importantly, the common theme of all these questions is 'How do these changes affect me?'. For that reason, Martin Salvo (author of this blog) will be hosting free regular online Webinars titled '​457 CHANGES 2017 - IMPACTS TO YOUR ELIGIBILITY FOR PERMANENT RESIDENCY' which will walk you through everything you need to know about the changes, the timeline of future planned changes, and most importantly, whether or not your eligibility for permanent residency has been, or will be, affected. See a quick video below of Martin explaining this Webinar further. Alternatively, if you have any questions relating to this blog and how these changes affect you, then please leave an online enquiry clicking on the link below. We will respond within ​24 hours! ​Also, click here for more useful blogs by our Immigration Lawyers. PIC4020 - Dont Lie to the DIBP! The intention of PIC 4020 is to reinforce the Australian migration system and discourage visa applicants from submitting bogus (fake) or misleading information or committing identity fraud. You will be affected by PIC 4020 if you have provided a bogus document or information that is false or misleading in your visa application (or previous visa applications) (PIC 4020(1)). You will also be affected by PIC 4020 if the Minister for Immigration (DIBP) is not satisfied over your identity in your visa application (PIC 4020(2A)). If you fail either of the abovementioned criteria, then your visa may be refused and depending on the reasons for refusal, you may also be subject to a 3 or 10 year ban on further visa applications that contain PIC 4020.
previously provided a bogus document that is false or misleading in relation to a visa that you held in the 12 months before making your application. It is important to note the case officer can look at previously lodged visa applications in the past (with regards to visas you held within the last 12 months) and in the event that there were previously submitted bogus documents or false or misleading information, it may be grounds to refuse your current visa application. The bogus documents or false or misleading information can include (but not limited to) your birth certificate, your criminal or health history, your skills assessment, your employer’s information, your work experience, your English test results and your education qualifications. Importantly, the bogus document or misleading information must be false or misleading in a material particular, meaning that it should relate to the visa criteria which you are being assessed under for the DIBP to refuse the application under 4020.. Importantly, if the document or misleading information provided is not related to the visa criteria, there may be grounds to argue that you do not fail PIC4020. If you fail to meet this PIC 4020 requirement, your visa may be refused and you will be prevented from being granted further visas for three (3) years, on visas that include PIC 4020 as part of the criteria. Can I get this requirement waived? the nature and extent of the fraud (such as the amount of misleading information and any history of attempting fraud against Australia’s migration program). It is also important to note that when seeking to waive this requirement, the interests of the applicant are not relevant when addressing the compelling or compassionate circumstances, and it only affects Australian citizens, permanent residents or eligible New Zealand citizens residing in Australia. biometric evidence concerning your physical attributes, facial images and fingerprints. This PIC 4020 provision applies to visa applications lodged on or after 22 March 2014, and all visa applications made, but not finally determined before 22 March 2014. If DIBP suspects that you (or any other person included in the application) are not the person you are claiming to be or have changed some aspects of your identity in the visa application, then they may refuse your visa application. If your visa is refused under this PIC 4020 requirement, it is because you did not satisfy DIBP of your identity, then you may be prevented from a further visa grant for ten (10) years, on visas that include PIC 4020 as part of the criteria. If you are affected by this PIC 4020 identity provision then there is NO waiver available, or for the 10-year non-grant period. You will be offered to comment and a chance to reply (natural justice) before the visa is refused, however if you are unable to satisfy DIBP as to your identity then your application will be refused, and no waiver will be accepted. You have lodged a skilled independent visa (subclass 189) with documents that appear to be genuine. You provided your date of birth, indicating that you are 31 years of age in your skills assessment and visa application. In fact, you are 33 years of age, and your intent was to score enough skill points to be eligible for the skilled visa. The case officer discovers that you have lied about your age, and then forms the opinion that you have provided false information about your identity. The case officer may then refuse your visa application and you may then be subject to a ten (10) year ban on further visa grants, because you have failed to satisfy the identity requirement in PIC 4020(2A). You have provided a ‘bogus document’ or ‘information that is false or misleading’ in relation to your identity, such as your brothers passport, instead of your own, because you did not have a valid one at the time of the application. Your intent was to submit your new passport once it was ready. However, when the case officer discovers this identity issue, they give you the chance to comment on the document, and you admit to providing your brother’s passport. You provide the real passport to the case officer, and they may be satisfied with the identity requirement (PIC 4020(2A)), however, you would still fail to meet PIC 4020(1), by providing a bogus document or information that is false or misleading. Consequently, you could be prevented from being granted further visas for three (3) years, on visas that include PIC 4020 as part of the criteria. If you have been affected by PIC 4020 please feel free to in get in contact on 1300 644 788 or leave your questions here. The Australian Government accept de facto relationships for the purposes of Australian visas. Accordingly, this applies to both Australian Partner visas specifically (Subclass 820/801, 309/100) as well as other visas that allow migrants to attach their partners as secondary dependents. Importantly, in accordance with Reg 2.03A of the Migration Regulations 1994 (Cth), de facto couples will need to demonstrate that they have been in a de facto relationship for at least 12 months prior to the lodgment of a visa. Accordingly, if you are unable to meet the 12-month requirement, you may be exempt from the 12 month rule if you register your relationship in the Australian State or Territory you are currently residing in with your partner. Importantly, the abovementioned State’s (and Territory) currently have laws in place allowing for a relationship to be registered in accordance with the Acts Interpretation (Registration Relationships) Regulations 2008, meaning that the registration will be recognized for Australian migration purposes and exempting the relationship from the 12 month rule. Although Western Australia (WA) does allow de facto relationship registration, it is currently NOT recognised for immigration purposes. To register in QLD you can visit the Queensland Government website which will direct you how to apply for a Registered Relationship (or Civil Partnership) certificate at the Brisbane Registry of Births, Deaths and Marriages. QLD requires that at least one (1) partner must have lived in Queensland for at least 6 months, and evidence must be provided. There is a 10-day cooling off period before your relationship is processed for registration, and option to withdraw the application if you change your minds. To register in NSW you can visit the NSW Government website which will direct you how to apply for a Registered Relationship (or Civil Partnership) certificate at the Registry of Births, Deaths and Marriages. NSW also requires that at least one (1) partner must live in NSW, and evidence must be provided. There is a 28-day cooling off period before your relationship is registered, and option to withdraw the application if you change your minds. To register in the ACT you can visit the ACT Government website which will direct you how to apply for a Registered Relationship (or Civil Partnership) certificate via Access Canberra. The ACT also requires that at least 1 partner must live in the ACT, and evidence must be provided. To register in VIC you can visit the VIC Government website which will direct you how to apply for a Registered Relationship (or Civil Partnership) certificate at Births, Deaths and Marriages. VIC also requires that at least 1 partner must live in VIC, and evidence must be provided. It will take a minimum of 28 days for the registration to be completed. To register in TAS you can visit the TAS Government website which will direct you how to apply for a Registered Relationship (or Deed of Relationship) certificate at TAS Births, Deaths and Marriages. TAS also requires that both partners must live in TAS, and evidence must be provided. It will take a minimum of 28 days for the registration to be completed. Depending on which Australian visa you are applying for, you may be required to undertake a medical examination to demonstrate that you are not a health risk to the Australian community. Section 60 of the Migration Act states that, a medical examination must be completed for the relevant visa to be granted. Notably, when applying for an Australian visa, should the medical examination find that you (or any of your included dependants to the application) are a health risk/liability to the Australian community, your visa application may be refused. So, it is important to be aware that when a health or medical examination is requested, you must ensure that you comply with the request to satisfy the health criteria requirement. Whether you are applying inside or outside Australia, the Department of Immigration & Border Protection will expect you to make every reasonable effort to be made available for, and attend, a medical examination when requested. Keep in mind that you are NOT able to obtain a medical examination from ANY doctor or physician, but rather only from authorised medical visa services such as Bupa Medical Visa Services (if you are in Australia), or recognised overseas Panel Physicians (if you are outside Australia). After you have attended the medical examination your case officer will inform you if there are any issues with your health. If you ARE required to complete any health examinations, you will be asked to provide further medical information, and will be issued a HAP ID (Health Identifier). After you have attended the medical examination your case officer will not be able to provide you with the results. You will then be able to log back into your ImmiAccount and lodge your visa application, making sure that you provide your HAP ID, as it will be linked to your recently completed medical examination. If you are applying for a visa whilst outside Australia you will need to arrange a medical examination with a Panel Physician within your country. Similar to the steps above, if you have already lodged your visa application, you will need to wait for your case officer to contact you (or your Registered Migration Agent) to determine whether you need to undergo a health examination. They will provide you with instructions on how to make an appointment with a Panel Physician within your country. You will also be provided with the HAP ID, and you will use this HAP ID to log into eMedical and complete your eMedical Referral Letter to arrange an appointment (unless you have been instructed differently from the case officer). If you want to arrange a medical examination, and you are outside Australia and have not lodged your visa application, you will need to see if your country is supported with Electronic Health Processing. Otherwise, you will need to wait until AFTER you have lodged your visa application, and contacted by the case officer. Completing health examinations before lodging a visa application is not recommended for everyone and DOES NOT guarantee quicker processing. How do I find an overseas Panel Physician? You will need to locate the list of overseas Panel Physicians on the Department of Immigration and Border Protection website, by clicking here. You then need to scroll down to the sub-section titled ‘Panel Physician’ and locate the one closest to your location or the one specifically mentioned by your case officer. This sub-section will contain the location and contact details of the selected Panel Physician. Keep in mind that you will need to have a HAP ID provided by the case officer before making an appointment and the correct forms or eMedical Referral Letter to arrange an appointment (unless you have been instructed differently from the case officer). If you require the representation of a Immigration Lawyer in Brisbane today, then give us a call on 1300 644 788 or send your enquiry here. Do You Pass the Character Test? All visa applicants and visa holders who want to enter or stay in Australia must pass the Character Test as outlined in Section 501 of the Migration Act 1958 (Cth) (‘the Act’). As part of the visa application process, the Department of Immigration and Border Protection (‘DIBP’) will ask you to disclose any criminal or security related history in your visa application, and in most cases, supply police clearance certificates. This information will be used to evidence whether you pass the Character Test. Furthermore, all visa holders in Australia must continue to meet the character requirements otherwise risk having their visas cancelled. In some serious cases, your visa must be cancelled due to serious and substantial criminal convictions whilst holding an Australian visa. The Character Test is the same for both visa applicants and visa holders. where you have been found by a court to not be fit to plead, and nonetheless based on evidence found, that you committed the offence and resulting you being detained in a facility or institution. How Do I Pass The Character Test? You must satisfy the Minister that you are of good character and have NOT been caught by any of the section 501(6) offences. If you are NOT caught by any of the section 501(6) offences, you are taken to have satisfied the Minister that you PASS the Character Test, and subsequently satisfying the character requirements of your visa application. Conversely, if you ARE caught by the section 501(6) offences you are taken to have FAILED the Character Test, and subsequently not satisfying the character requirements of your visa application or visa holder conditions! What Happens if I Fail The Character Test? If you are a visa applicant and have failed the character test, this means that you have NOT satisfied the Minister that you are of good character, and the Minister has the ‘discretionary power’ to refuse your visa application. Alternatively, if you are a visa holder the Minister has the ‘discretionary power’ to cancel your current visa. What Does ‘Discretionary Power’ Mean? If you have NOT satisfied the Minister that you are of good character, then the Minister has a discretion (discretionary power) to grant, refuse, or cancel your visa. This discretionary power only arises if the Minister is NOT satisfied that you pass the Character Test. This essentially means that the Minister will now need to make a final decision according to section 501(6), that you ARE NOT of good character (since you have failed to convince the Minister that you are of good character). Before a final decision is ready to be made, the Minister has further Directions under section 499 of the Act, directing how the character provisions are to be applied. Subsequently, this directs the Minister (and delegates) to Ministerial Direction No. 65 (commenced on 23 December 2014), which are directions to guide decision-makers performing functions or exercising powers under section 501 of the Act. This is significant because, it provides guidance and instructions to those decision-makers, as to when a person is NOT of good character, and the important considerations which must be considered before making a final decision on your visa application or visa status. This is important for you to understand because it directs the decision-makers to consider all your relevant circumstances, especially those which relate to the protection of the Australian community, best interests of minor children in Australia and the expectations of the Australian community. Furthermore, unlike government policy (which we have mentioned in our previous blogs), Ministerial Directions have the force of the law, and therefore not only bind the DIBP decision-makers (case officers) but also Tribunal members (the decision-makers who deal with appeals at the Administrative Appeals Tribunal). It is therefore fundamental that when responding to the DIBP in relation to your character, that this Ministerial Direction be understood and applied correctly. What Are My Options If I Fail The Character Test? If you find yourself in a situation where you suspect that you may not pass the Character Test, or if you have received formal notification from the DIBP relating to your character, it is worth discussing your case with our Registered Migration Agents. It will be our job to persuade the Minister (and delegates) that you are of good character, and if you have failed the Character Test, that they exercise their ‘discretionary powers’ to consider all the relevant considerations and take into account all your circumstances before making a final decision. Get in contact on 1300 644 788 or send your questions here. RSMS Cancellations - Do They Really Happen? Yes! Here's How to Avoid It! Section 137Q of the Migration Act 1958 (Cth) can be used by the Department of Immigration and Border Protection to cancel Regional Sponsored Employment (Subclass 187) under certain circumstances. Importantly, if you hold a Subclass 187 visa (or the now discontinued Subclass 119 or Subclass 857 visas) and have received a notification of an intention to cancel your visa, the following information will assist you in understanding why you might be in this position and what arguments you may be able to put forward to avoid the cancellation of your hard earnt visa, or if necessary, what you can put forward to the Tribunal should you appeal such a cancellation. This cancellation power activates when the visa holder fails to commence the employment referred to in the relevant nominated position, AND the visa holder is unable to demonstrate a genuine effort to commence that employment within the prescribed time frame (s 137Q(1)). For instance, if you were granted a subclass 187 Regional Sponsored Employment visa to work as a Chef in Mackay QLD on 1 July 2016, and you decided to take a holiday for 7 months around Australia before you started work – this could activate the cancellation power. The time frame which the Department of Immigration expects you to start working on the subclass 187 visa is within six (6) months from the date of the visa grant (if applied for the visa in Australia) or when you first arrived in Australia (if applied outside Australia). However, if circumstances were different and you made genuine attempts to start your new employment, but were prevented due to factors beyond your control (such as your employer delaying your start date due to financial complications or you are unable to start work due to a medical reason) then there is scope to argue against an intention to cancel your visa. An example of a case where an applicant made genuine attempts to start the new employment can be found here. remained in Mackay despite being financially stretched, due to the employer suggesting that the applicant was not in breach of his visa and would not be cancelled. The Tribunal found that conduct of the employer was unsatisfactory and ultimately left the applicant in a very difficult and financially stringent situation. The Tribunal considered the personal circumstances of the applicant and confirmed that the grounds for cancellation were clearly beyond the applicant’s control. The actions of the employer left the applicant vulnerable as he continued to wait for the promised job, that never eventuated. As a result, the Tribunal agreed that the visa should not have been cancelled under section 137Q(1), due to the applicant’s clear and genuine attempt to start work. An RSMS visa can also be cancelled if the visa holder commenced the employment but left the job within two (2) years, AND the visa holder is unable to demonstrate a genuine effort to be engaged in that employment for the required employment period (s 137Q(2)). For example, if you decided you didn’t want to work as a Chef in Mackay QLD anymore, and left your regional sponsored employer after 1 year of working and then travelled to Brisbane to study – this could activate the cancellation power. However, if circumstances were different and you made genuine attempts to remain in your current employment, but you were fired due to a disagreement with your employer or your employer is suffering from financial loss and is unable to keep you employed, then it is arguable that you are not in breach of s 137Q. An example of a case where an applicant did make genuine attempts to remain in their current employment for 2 years can be found here. the applicant did make genuine efforts to work with the employer, and it was the employer who was ultimately unhappy with the applicant’s work, and terminated the employment agreement. The Tribunal outlined that to cancel the visa under section 137Q(2) the applicant must NOT have made genuine attempts to commence and remain in the position for two (2) years. In this case, the applicant genuinely wished to be employed by the nominated business, but was just nervous and slow to making adjustment to working in Australia. The Tribunal was satisfied that the applicant did make a genuine effort to be engaged in that employment for the required period and therefore cannot be cancelled under section 137Q(2). How do they assess a ‘genuine attempt’? Government Policy is used to assist in deciding what normally constitutes a genuine attempt by an RSMS visa holder. ·any other matter which is relevant to the commencement or termination of the employment. financial loss, bankruptcy or closure of the business. Importantly however, a situation intentionally created by the visa holder that results in termination of their employment would not be considered a genuine effort. Still confused over cancellation powers? Even if the delegate determines that grounds for cancellation do exist, there may be circumstances particular to the visa holder that need to be considered when assessing whether to exercise the discretion to cancel the visa under s137Q. This means that even though you may be potentially subject to having your visa cancelled under Section 137Q, the case officer can also exercise their discretionary powers to consider other relevant circumstances or facts, to not cancel the visa. the visa holder’s past and present behaviour towards the department (for example, whether they have been truthful and cooperative in their dealings with the department). If you find yourself in either one of these circumstances, and you have made genuine attempts to commence or remain in your current employment it is worth discussing your case with our Registered Migration Agents! Feel free to contact us on 1300 644 788 or send your questions here.